To take a journey is to travel from one place to another. To take a personal journey is to pass or progress from one stage to another. Both definitions hold true in the life journey of San Clementean Pondo Vleisides. His has been a journey of passage from boyhood to pastorship, and it has been one involving several places and many stages. The youngest of three sons, Pondo’s personal pilgrimage began with his birth in South San Clemente some 40 plus years ago. His mother Marlene Vleisides, longtime resident and Director of the San Clemente Presbyterian Church Pre-School for 38 years, says he was blessed with a heart of compassion from the time he was born. “Pondo always had lots of empathy for his friends and was always helping them,” Marlene remarked. “I even remember one time when he was in the 8th or 9th grade, I overheard him actually trying to counsel some of his friends,” she chuckled. It would be that natural gift for relationship that in later life would translate into a heart for youth and be key to the path Vleisides would eventually follow; while appropriately growing into a man framed in a teddy-bear body large enough to house a huge heart and gentle spirit. At three-years-old Pondo Vleisides began attending Sunday school at the San Clemente Presbyterian Church on Avenida de la Estrella where his family attended services. When he was in first grade his mother began teaching in the Pre-School there.With the example of a mother in ministry and a family involved in church, Pondo grew into a teenager very involved with the youth group. The Youth Pastor during that time, Ken Mulder, was one of the first influences for youth ministry on Pondo’s, and even older brother Nick’s (now a pastor in Alamo, CA. ), life. But it was Pastor Corey Melia from Capistrano Community Church on Del Obispo in San Juan Capistrano who would be Pondo’s strongest mentor, teaching him about developing a relational and experiential youth ministry, culturally relevant to today. After leaving town to earn a BA in Psychology at the University of San Diego and eventually an MA in Psychology, Vleisides returned to San Clemente doing a stint owning his own moving business, the Mover’s Express. During that time he was spending ten hours weekly helping with the youth program at the Presbyterian Church. It was a tough choice, but with wife Perra - whom he met in the SCPC choir the “Branch” – alongside supporting him, Vleisides pastored the youth at SCPC for five years. During that time there were 150-plus attendees, and Pondo and Perra developed a youth ministry full of fun and rewarding programs: camps; orphanage trips; mission support; community services; bible studies; and sport trips skiing, rafting and motorcycling. Many of the kids in their group, upon becoming young adults, are presently living and working in town, involved in various Christian ministries. In the year 2000 Vleisides was called out to an Associate Pastorship of Family Ministries in St. Peters, a Presbyterian church in Huntington Beach, where he worked for three years. Then in 2003 he was called into his present position as Senior Pastor of the San Clemente Evangelical Free Community Church (evangelical meaning to share the Gospel and free meaning free to govern themselves), tucked away in an obscure location on the bluffs of Capistrano Beach. Presently in the process of finishing his Masters in Theology at San Francisco Theological Seminary, it is the memories of this personal journey that remind Pondo Vleisides where he’s been and where he’s going. Fond memories of growing up in San Clemente when it was a small town where you could walk across vacant lots to get from one place to another. Heart-felt memories of letters containing Bible verses from his mother while in collage. Special memories of the good times and changed lives resulting from his various ministries with adults as well as youth. As Pondo’s journey continues as Senior Pastor of a new church, he looks forward to the stages that await. The next phase in his travels is a movement of his present church to a temporary site in Talega while the congregation awaits construction of a new building on the corner of Avenida Pico and Camino Celisia. Like many in town, Pondo has much nostalgia for the old building where he saw his first movie at three-years-old. He and his congregation would still be interested in developing that site for a church, but with no more time to linger they know the plans for a new church must move on. 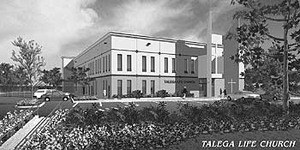 Since no parcels have been set aside in the Talega neighborhoods for churches, Vleisides is excited to have opportunity to plant the new Talega Life Church there. He hopes it will help set aside that “Talega vs town” mentality, uniting friends and families in both areas. Under his leadership his present church has expanded from about 20 members to an average of 100 attendees weekly, 60 committed members, 40 attenders and 20 children and youth. He and his congregation look forward to more growth when the new church building is completed. The average age of the young people listed here is 25. They have become involved in ministry as a result of membership in the SCPC Youth Group under the leadership of Pondo and Perra Vleisedes. Many of them hold jobs in town, some as teachers and firemen.